Spin Triumvirate: Essex’s David Acfield (Left), Kent’s ‘Deadly’ Derek Underwood (Centre) and the other half of Essex’s ‘spin twin’ partnership Ray East (Right). Essex 131 All Out (49 overs) & 34 All Out (19 overs). Kent 81 All Out (40.1 overs) & 86-3 (35 overs). Kent won by 7 wickets. By 1969 it was clear that Brentwood’s hosting of a County Cricket Week was on borrowed time. The Old County Ground hadn’t been allocated a Week the previous year, and it was common knowledge that the County were pretty impoverished and looking to jettison a large number of their festival grounds with the ultimate aim of making Chelmsford their headquarters and main home ground. And Brentwood had seemingly drawn the short straw in recent years in terms of when they were allocated their week. Every year since 1963, County games had been played at the OCG either in May (sometimes as early as 8 May) or at best the first week in June. The weather was frequently inclement, and the sideways slope of the ground meant that rainwater often ran down and under the covers, causing games to be abandoned all too often. And whether because of the weather conditions or a possible deterioration in the quality of the pitch, the fact is that in the eleven County Championship matches played at Brentwood between 1963 and 1969, a side only exceeded 300 on two occasions. The days of 803-4 and 570 seemed a long time ago. So it was that Kent arrived at the Old County Ground in May 1969 for what was only the second time since the Festival was reintroduced in 1934 – and of course Kent were the very first opponents after that reintroduction, so this was their first visit for 35 years. And the contrast between those two visits couldn’t have been greater. Essex won the toss and batted. Well, for a time, anyway. 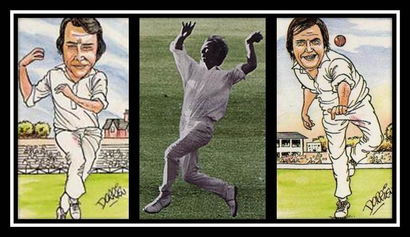 They were all out for 131 in 49 overs, with ‘Deadly’ Derek Underwood taking 6-45. But if Kent were feeling pretty chipper about that, it didn’t last for long. Forty overs later they too had been dismissed – for a mere 81, with the Essex ‘spin twins’, David Acfield and Ray East, taking nine wickets between them. With 105 overs due to be bowled in a day, there was still plenty of time for Essex to have another stab at batting, and by the close they had made it look a near-impossible exercise and capitulated to 30-7. So 242 runs had been scored in the day for the loss of 27 wickets. Sounds like one for the Pitch Inspectors. And Essex’s Stuart Turner had achieved the dubious distinction of “bagging a pair” in a day! Essex maintained their consistency on the second day by losing their last three wickets for four runs, but the question on everyone’s lips was how would Kent fare in their pursuit of 85? They would need to make the second highest score in the match, batting fourth on what was quite evidently a minefield. Well, in a total anti-climax they gaily knocked off the target in 35 overs for the loss of three wickets and anyone who felt like wandering down to the ground to watch a bit of decent County cricket after lunch on the second day was to be severely disappointed. But was it poor cricket, a bad pitch, indifferent weather, or a combination of any of those factors that conspired to produce such hapless performances? Clearly the pitch wasn’t great – but it wasn’t just the spinners, Underwood, Acfield and East, who benefitted. Kent’s fast bowler Norman Graham took 8-20 in Essex’s second innings, and Stuart Turner took three more wickets in the match with his seamers than he scored runs. Perhaps there is a bit of a clue to be found in the scorecard of the second match of the Week, against Worcestershire. The first day was curtailed by rain, so Worcestershire declared early on the second morning at 201-8. It might not seem many, but they had presumably decided that it would be too many for their opponents. And they were right: Essex managed a mere 92 all out in reply. But at least Stuart Turner made five. Worcester reached 153-8 by close of play, and with a lead of 262 were probably contemplating an early declaration. But it didn’t matter – the third day was washed out and Essex “escaped” with a draw. Essex have not played County Cricket at Brentwood since that May week 43 years ago. Officially the ground is reckoned to be too small – especially the boundaries at either end, which used to make Trevor Bailey grizzle apparently (presumably when he was bowling, since there is no record of him peppering the sightscreens when he was batting there!) And of course with the exception of Colchester, Festival Weeks are now a thing of the past. “Uneconomic” is the cry. But they were certainly a means to getting County cricket to as wide an audience as possible, and the players reputedly enjoyed the intimate atmosphere at these “out-grounds”. But what is undeniable is that Essex did themselves no favours with their performances at Brentwood in the later stages of their tenure there. Whichever way you look at it, 801-4 dec in 1934 to 34 all out in 1969 is a bit of a come-down. Perhaps, on the other hand, it was the groundsman who was to blame. Maybe he just couldn’t get top quality cow dung any more………..